Newman Library has received a special set of documents that provide insight into the military junta that once governed Argentina. 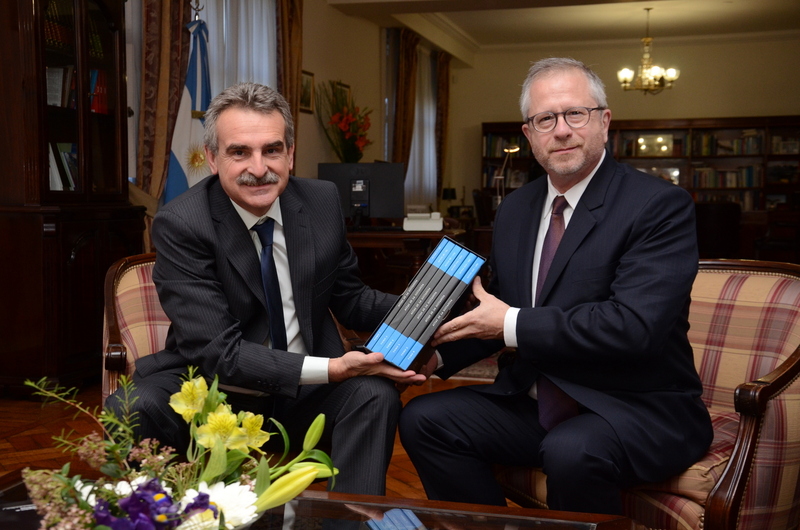 Agustín Rossi, Argentina’s current Minister of Defense, presented the documents to David Birdsell, Dean of the School of Public Affairs, as a gift to the Newman Library. The gift includes the six-volume set, Actas de la Dictadura, which records the meetings of the junta leadership (1976–1983). In addition, there is a pamphlet, Lista Negras, that reproduces the lists of artists, musicians, journalists, writers, academics, and other intellectuals who were persecuted by the government for their supposed Marxist views. The books will be display in the Library’s Engelman Reading Room through October 31. After the exhibition, the documents will be available for use in the Archives and Special Collections Division. The significance of the documents and the importance of their being available through the Newman Library are discussed in the press release from the Ministry of Defense.